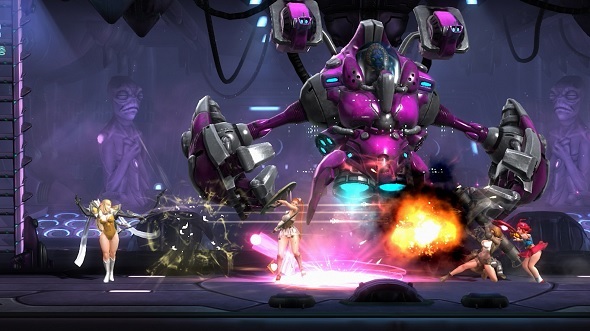 Free Steam keys: Win a copy of energetic mash-up MOBA Hyper Universe! What do you get when you cross a mad white lion, a Power Ranger, a ninja woman in a skimpy outfit, and a man-eating plant? The answer is Hyper Universe. It’s a madcap side-scrolling MOBA that mashes together characters from the many games under publishers Nexon belt, as well loads of other wild original creations. These characters are called Hypers and they’re clearly the game’s main appeal. Nexon knows this, leaning into their absurdity in every single description of the game, just get a load of this: “A mage who rains down giant snowmen, a mongoose riding astride an armored rhinoceros, a tentacled Admiral with the power of the kraken at his call, and more!” See? Anyway, the idea here is that people and creatures from across the multiverse have clashed – that explains the huge variation in character design. Now together, they must fight, obviously, and do so in seven-tier stages where they must defend their tower from the opposition, beat up mobs, and take on a boss right at the top. In summary, this is one of the wildest MOBAs out there right now, so wouldn’t you like to give it a go? You’re in luck. We have 50 Steam keys for Hyper Universe that we’re giving away. In order to put your name forward to win one all you need to do is enter via the widget below.